Child care and early education policies are shaped by a history of systemic and structural racism. As a result, there are major racial disparities in children’s access to quality child care that meets their cultural and linguistic needs and enables their parents to work. Early care and education workers are overwhelmingly in low-quality jobs with inadequate compensation. And workers of color are often relegated to the lowest-paid positions. According to research, high-quality child care and early education is critical to children’s development and family economic stability, particularly for low-income children and parents.1 It is critical that children of all racial, ethnic, linguistic, and cultural backgrounds have equitable access to quality early childhood programs. Further, such programs should employ a diverse workforce with equitable access to high-quality jobs that include compensation reflecting the importance and difficulty of their work as well as the field’s increasing qualifications. 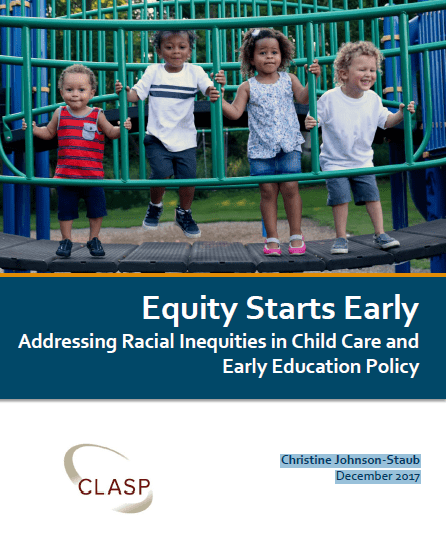 Addressing racial inequities in the early childhood system will require increased investments at the state and federal levels and smart policy decisions about expectations for, and delivery of, child care and early education.